Clear skies and warm air mark spring’s arrival in Phoenixville; so too will the perennial act of sprucing up the town. In mythology, April is the month of Aphrodite, the goddess of beauty, and in keeping with that theme, the Phoenixville Town Watch will be cleaning up, with the public’s help. Phoenixville Town Watch is excited to announce Spring Community Cleanups Days will take place on Wednesday, April 18th and Saturday, April 28th and is encouraging area residents to get involved. Picking up trash, sweeping sidewalks, and raking debris from the curbside areas may require some sweat equity, but it’s well worth the effort. These projects will not only improve the landscape of Phoenixville, they will create a great foundation for working together moving forward. Many local organizations will also be joining together for this worthy event, including the Phoenixville Business Association (PABA), the Phoenixville Green Team, the Valley Forge Christian College, the Phoenixville Girl Scouts, and the Borough of Phoenixville. On April 18th, town watch members, Valley Forge Christian College students, and any interested members of the public will meet at the Kiwanis Children's Plaza (217 Bridge Street), at 9:00 a.m. The day’s efforts will focus on Bridge Street between Starr and Church Streets, Gay Street between Bridge and Church Streets, Church Street between Bridge and Main Streets, Main Street between Walnut and Andre Thornton Park, and wrapping up on High Street. 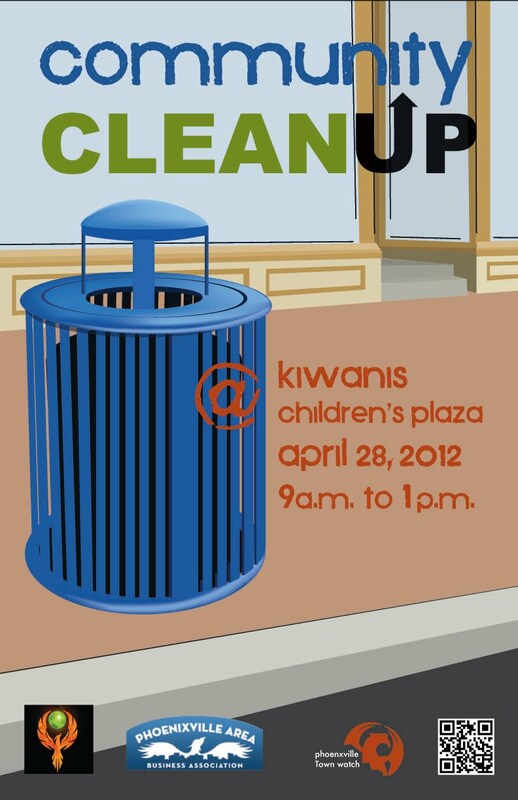 The starting point on April 28th will be the same, the Kiwanis Children's Plaza, at 9:00 a.m. The focus of this day’s efforts will be on cleaning up the downtown business district. Volunteers will recycle and reclaim as much of the refuse as possible, with assistance from the Phoenixville Borough. Rain date is May 5th. Spring Community Clean-Up Days dates back to 2006 when one ton of garbage was collected! It’s a great annual tradition, one that Phoenixville Town Watch is eager to continue for many years to come. If you can help, please bring work gloves, and if possible, rakes and shovels. Bags and water bottles will be provided. Sunscreen and hats are suggested. For additional information, please go to facebook.com/pvilletownwatch, or e-mail Phoenixville Town Watch at pvillewatchband@gmail.com.